Keith Ellison and Andre Carson receive considerable attention as the first two Muslims to serve in the U.S. Congress. The novelty of their presence, however, should not obscure the fact that Congress includes other representatives, invariably on the left wing of the Democratic party, who also carry water for Islamist interests and causes. Not themselves Muslim, their relative obscurity attracts less attention to them and may make them more effective. For example, when the U.S. House voted 390-5 in 2009 in favor of a resolution concerning Israel's right to self-defense against Hamas, Carson voted for the resolution and Ellison voted "present." In contrast, Dennis J. Kucinich, Gwen Moore, Ron Paul, Nick Rahall, and Maxine Waters cast the "no" votes. In addition to those five, their ranks also include Cynthia McKinney, Gregory Meeks, and James Moran. 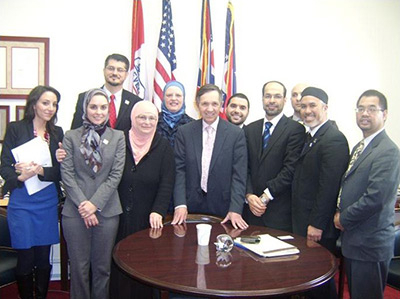 Kucinich (in the middle) meets with ten members of the CAIR staff including Nihad Awad, executive director of the national office. Kucinich, 65, a representative from the Cleveland area since 1996 whose recent primary loss signals the probable end of his political career, offers the single best example of this phenomenon, having gone further down this path than any other national elected official and receiving more attention for it, particularly during his campaign for president of the United States in 2004. This respectable showing brought considerable news coverage to his 2004 campaign that in turn uniquely exposed the candidate's positions and activities vis-à-vis Islamism. Already before 2004, Kucinich had displayed a soft spot for Islamism, defined as the ideology seeking to apply Islamic law (the Shari'a) worldwide. For example, he insisted on accepting a $500 donation in 1997 from Washington's then reigning Islamist, Abdurahman Alamoudi. Only after Alamoudi was arrested in 2003 on charges of taking money from Libyan intelligence, charges which landed him a long jail term, did Kucinich finally return the 1997 contribution. In his 2004 presidential campaign, Kucinich adopted key elements of the radical Islamic message and worked closely with North America's most aggressive Islamist group, the Council on American-Islamic Relations (CAIR). He echoed its line about American Muslims having "suffered much over the last few years" and their having "been scapegoated and they've been subject to profiling and have been subject to law enforcement practices which are truly repugnant in a democracy." He presented key policies (opposition to the Iraq war and the Patriot Act, "support of Palestinian rights") as being Muslim-friendly. He even argued that his proposals for universal healthcare and expanded public education "are consistent with their [Islamic] religious beliefs about providing for the less fortunate and the needy." "Leslie Sinclair, also known by the Arabic name Munira, expresses her enthusiasm for Dennis Kucinich at Idriss Mosque near Northgate" in Washington State on February 3, 2004. Kucinich identified himself closely with American Muslims, calling them the bellwethers of the U.S. government's "intolerance, surveillance, and oppression." At times, he waxed lyrical: "In its suffering the Muslim community is helping America to transform. We're defending all Americans, all liberties. Stand up and live your faith: Celebrate Islam. Promote and share understanding. This country owes you a debt of gratitude." At other times, he got emotional: when he denounced the deportation of an illegal Muslim immigrant from Venezuela, the Cleveland Plain Dealer described his eyes "brimming with tears" as he declared his intent "to move heaven and earth" to keep her in the country. A reporter described how, in one remarkable meeting with Muslims, Kucinich quoted the Qur'an with "the passion of an itinerant preacher" and roused the audience to get on its feet and chant "God is great" (Allahu Akbar). To another Muslim audience he announced, "I keep a copy of the Quran in my office." He has hired or taken as interns a number of Muslim Americans. [DP comment: for example, Souheila Al-Jadda served on his House staff.] He meets regularly with his Muslim and Arab-American constituents in Cleveland. In his presidential campaign he has spoken several times at CAIR events, the only candidate to do so - and in spite of getting some very negative press from right-wing commentators for it. [DP comment: judging by the "Muslims for Kucinich" website, this is a reference to me] He also spoke at the ISNA [Islamic Society of North America] convention on August 30, 2003. In addition, the site went on, Kucinich "created the post of National Muslims for Kucinich Coordinator on his campaign staff." In all, "Muslims working as campaign volunteers, including the National Muslims for Kucinich Coordinator, have found not only the candidate himself but also his staff to be welcoming and indeed eager to work with them and to reach out to the Muslim community." Leaders in national Muslim organizations like CAIR, ISNA, and the American Muslim Alliance have expressed support for Kucinich's candidacy. A group of nearly 100 supporters, ordinary Muslims from around the country, have organized an email list to receive updates on the campaign and learn about volunteer opportunities. The membership of this group has tripled in the last month [DP comment: this page is not dated, so it is not clear which month is referred to] and continues to grow on a daily basis. There does not seem to be any comparable organized group of Muslims supporting any of the other candidates. In return for these expressions of solidarity, Kucinich looked for Muslim electoral support. Not surprisingly, Kucinich urged Muslims to vote as a block so as to enhance their political muscle; this not only followed the Islamist organizations' line but presumably reflected his hope to be the beneficiary of their votes. 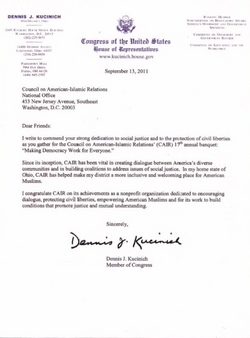 November 30, 2003: Kucinich spoke at CAIR's Seventh Annual Fundraising Banquet outside of Washington, D.C.
December 20-21: Kucinich electronically addressed the annual convention of the Muslim Public Affairs Council and won 17 percent support in its straw poll, coming in second behind Howard Dean. December 30: At the behest of CAIR Kucinich visited the Islamic Society of the Tampa Bay Area, was "shown around a free medical clinic, full-time Muslim school and food pantry for the needy," and he met with CAIR members. CAIR's communications director in Florida, Ahmed Bedier, announced his approval of Kucinich: "We can feel the sincerity and the emotions and see that he believes what he is saying. It's rare to find someone in Washington like that." 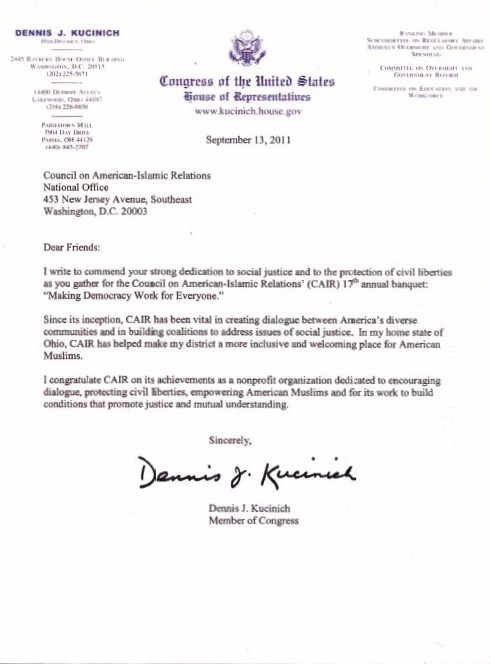 January 13, 2004: CAIR's Ahmed Bedier praised Kucinich for carrying "with him the flag of true patriotism and the message of inclusiveness and peace." January 25: Kucinich appeared at a presidential campaign forum in Houston co-hosted by CAIR. January 27: Steve Cerny, Virginia co-chair of Kucinich for President, sent out a memo addressed to "Muslim Supporters of Kucinich for President," that began with "Assalaamu Alaykum" (normally a phrase only used among Muslims) and pleaded with recipients to attend an organizing meeting on Jan. 31. Cerny told about "a major presence at the big Eid celebration at the DC Armory" on, Feb. 1, other Eid celebrations, and at "as many mosques as we can" on Feb. 6. Cerny also told about plans to print 30,000 flyers targeted to the Muslim community, the campaign's lists of registered Muslim voters and its plan to call them "to remind Muslims of the election and ask their support for Kucinich." February 1: Kucinich started the day "at an Islamic Festival at the University of New Mexico where he told attendees that, as president, he would work to rebuild relations between the Muslim community and the U.S. government." February 3: Kucinich spent 1½ hours at the Idriss Mosque in Seattle, half an hour with the leaders and an hour with the community. The invitation made two statements of note: (1) This event "may include salat al-maghrib, observed by Representative Dennis Kucinich." (2) Kucinich, not the mosque, initiated the event when he "requested to meet with the local Muslim Community." February 28: Kucinich visited the Masjid Omar ibn Al-Khattab in downtown Los Angeles and discussed Iraq, education, and the prison system with about 65 persons. March 8: At an event sponsored by CAIR's San Antonio office, Kucinich met with a reported 400 Muslims. Sarwait Husain, the head of that office, announced at the occasion: "Even if he doesn't win [the presidency], he can represent our voice in Congress." 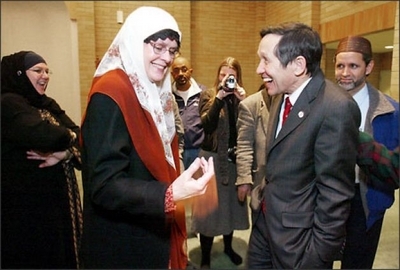 "Democratic presidential candidate Dennis Kucinich addressed issues of peace and civil liberties at a gathering of San Antonio's Muslim community on March 5[, 2004]." Kucinich continued along the same path of reaching out to Arabs, Muslims, and Islamists. For example, his website long continued to list "Arab Americans" as an "issue." He visited the Middle East in 2006 during the Hizbullah-Israel war and focused exclusively on the destruction caused by Israel and did not visit the scenes of Hizbullah attacks in Israel. In June 2007, the U.S. House of Representatives voted 411 to 2 for Resolution 21, "Calling on the United Nations Security Council to charge Iranian leader Mahmoud Ahmadinejad with violating the 1948 Convention on the Prevention and Punishment of the Crime of Genocide and United Nations Charter because of his calls for the destruction of the State of Israel." Kucinich (along with Ron Paul) was one of the two to vote against the resolution. In 2008, according to the far-left Inter-Press Service, Kucinich alone of the presidential candidates attempted to court the Muslim vote. That same year, he condemned U.S. policy vis-à-vis Iran but not Iranian policy vis-à-vis the United States and called for establishing a "National Commission on Truth and Reconciliation" which he wants to "have the power to compel testimony and gather official documents to reveal to the American people ... the underlying deception" that was the Bush administration's response to 9/11. 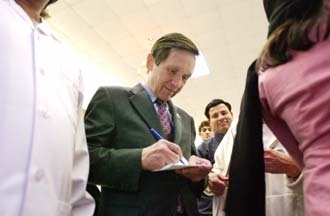 Kucinich called on Muslim support in 2009, stating that the health care issue offers Muslims "the opportunity to reach out to people of all faiths. This is a teachable moment for Muslims, whose every greeting has peace in it. Get involved in the current debate." In a 2010 interview with Turkish Policy Quarterly, Kucinich fawningly addressed Turks and their Islamist government: "To my Muslim brothers and sisters in Turkey I say Selamunaleykum. We should be extending peace to each other. Turkey is an open, democratic, pluralistic democracy and the U.S. should promote respect for Islam." Also in 2010, Kucinich adopted the Islamist line that drone strikes against Al-Qaeda targets conducted by the Bush and Obama administrations have helped stoke "fanaticism and radicalism." Kucinich is reported to be the only member of Congress publicly to condemn the Obama administration's 2010 authorization to assassinate Anwar al-Awlaki, the U.S. citizen and terrorist sponsor in Yemen accused of ties to several attacks in the United States. He is probably the only one in 2011 to praise the government of Syrian dictator Bashar al-Assad for showing "a willingness to listen" to the opposition that he was at that moment massacring. Although Kucinich cut an eccentric figure among the Democrats running for president – seeking the Islamist vote in 2004 was a sure way not to reach the White House – his close association with radical Islam was innovative and pathbreaking. Dennis Kucinich also went to a few Muslim functions. However, those functions were arranged by major national organizations as part of their fund raising efforts. Those meetings were not organized on election 2004 issues. "What we witnessed in Milwaukee is a new phenomenon. Muslim voters are making a bold statement and creating a grassroots movement of political empowerment without the influence of major political establishment," said Dr. Aslam Abdullah, the founding director of MECA. Can we expect to witness future Democratic candidates promising to espouse Muslim interests (as defined by CAIR and its ilk) to the White House? I expect so. More broadly, one sees a growing connection between the Left and radical Islam, as plumbed by David Horowitz in Unholy Alliance (Regnery) and by me in a number of articles. Among many other consequences, a long-term sorting out of votes is currently underway; as I wrote in 2003, "Arabs and Muslims, for all their sympathy for Republican economics, will vote Democratic, and Jews, for all their agreement with the Democrats on abortion, will vote Republican." Mr. Pipes (www.DanielPipes.org) is president of the Middle East Forum and Taube distinguished visiting fellow at the Hoover Institution of Stanford University. © 2012 by Daniel Pipes. All rights reserved. Apr. 21, 2018 update: Six years later, Kucinich is trying to revive his political career by running for governor of Ohio. Just days before the May 8 primary, however, it's come out that two brothers, Elie and Bassam Khawam, closely linked to the Bashar al-Assad regimein Damascus donation $20,000 to the Kucinich Action PAC and funded Kucinich's trip to meet Assad. Fellow Democrat and former Ohio Gov. Ted Strickland, a supporter of Richard Cordray in the race, commented that "Kucinich has been an outspoken defender of the Assad regime in Syria even as it killed countless people and has repeatedly used chemical weapons against defenseless civilians."